OnePlus will soon launch the OnePlus 6T as an upgrade to the popular OnePlus 6. The device has been in the rumors mills from the last couple of months. We have also seen a few leaks revealing key details of the device. 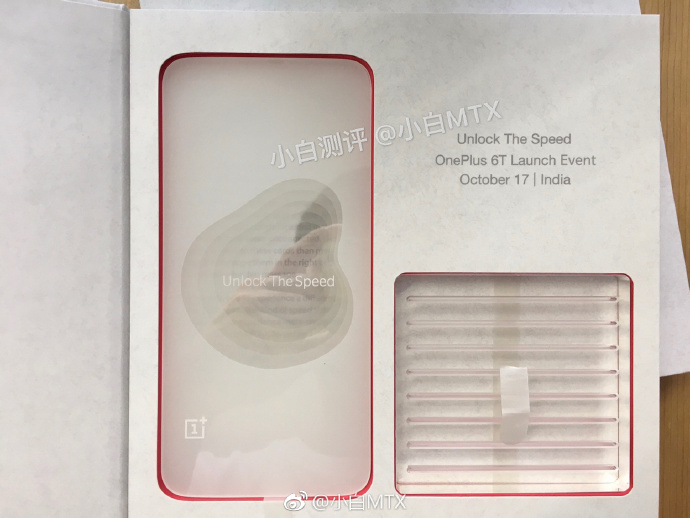 Now, the leaked invite confirms the OnePlus 6T India launch date as October 17th. This is the same date that is mentioned on the OnePlus 6T’s screenshot shared by the company. If we see the last few product launches, OnePlus first unveiled the smartphones at the global launch event and then launched them later in India. While the leaked image confirmed October 17th to be the India launch date, the global launch should be held ahead of that date. A few days ago, the company has started rolling out the all-new Oxygen OS 9.0 update for OnePlus 6. The Oxygen OS 9.0 is based on the latest Android 9.0 Pie. Recently, the company has officially confirmed the device to come with an in-display fingerprint sensor. Based on the leaks, we can also confirm the device to sport waterdrop display with a V-shaped notch. While the OnePlus 6T will be coming with glass back body, it will also support wireless charging. We also expect to see the upcoming OnePlus 6T in Gradient color options. Stay tuned on Phone Radar for more details!